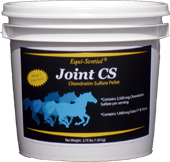 Equi-Sential® Joint CS is a scientifically formulated joint supplement that encourages the healthy growth and development of cartilage tissues. Equi-Sential® Joint CS provides maximum relief through the combined efforts of pharmaceutical grade chondroitin sulfate and yucca schidigera. The powerful antioxidants, Ester C® (Vitamin C), Natural Vitamin E, and Omega 3 Fatty Acids further add to its healing power.